The black-capped chickadee is the friendliest wild bird we have in this area to the point where people think of it almost as a tame bird. Whereas other birds will fly from the feeder when I open my door, chickadees will let me get within inches before they feel the need to fly. Perhaps it is because they are so quick and are not worried about being caught. I think it's because they are quick-witted. They understand perfectly well that I don't intend them any harm. Have you ever had a chickadee tap on your window to let you know that the feeder is empty? This has happened here more than once. I find it interesting that they tap the window. This means that they understand the concept of people being inside a building, since I never go out the window. You'd think they might tap the door. 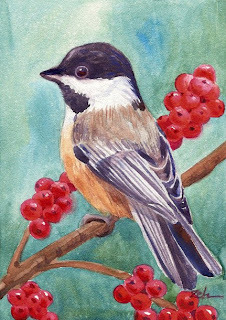 It was fun to paint this adorable little bird on a winterberry branch.